In a large bowl, beat the butter and sugar together until well-combined. Add the eggs and vanilla and mix until light and creamy. In a medium bowl, whisk together the flour, soda, salt, cinnamon and nutmeg. Add the dry ingredients to the wet batter and mix until just combined and a few dry streaks remain. The batter will be very stiff but will thin out after the apples are stirred in. Stir in the grated apple with any accumulated juice and mix until combined. No need to overmix, just stir until the apples are incorporated. Spread the batter evenly in the prepared pan. Bake for about 30 minutes until a toothpick inserted in the center comes out clean. For the cream sauce, while the cake is baking, combine the butter, cream and sugar in a small saucepan. Bring the mixture to a low simmer and stir until the sugar is dissolved and the mixture is combined. Simmer gently for 10 minutes, stirring often. Remove from heat, stir in the vanilla and keep warm until ready to serve. 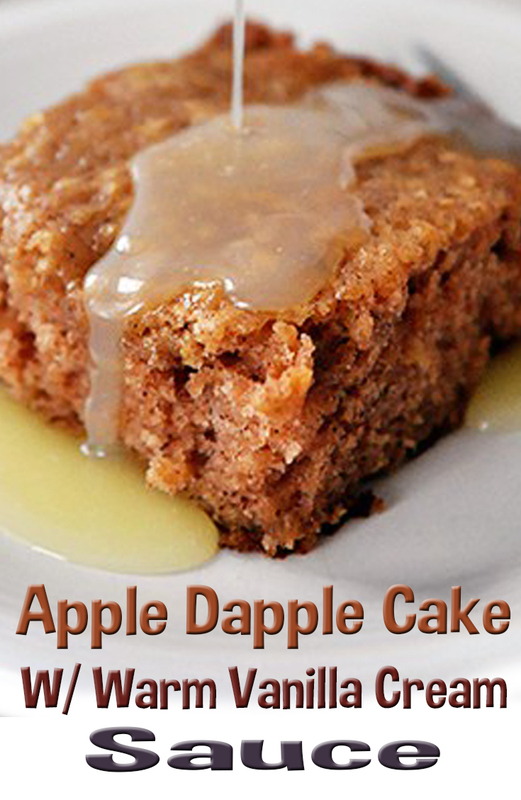 Cut the warm cake into pieces and drizzle with the warm cream sauce.